CockroachDB is new distributed database which, like its namesake, is really hard to kill. CockroachDB implements SQL DML commands for creating schemas, tables, and indexes using the same syntax as PostgreSQL, and it supports the PostgreSQL wire protocol, meaning that any PostgreSQL database driver or client can be used to connect to a CockroachDB database. If you’re currently using PostgresSQL and you want an easier scale-out, highly-available way to deploy a database, you should take a look at CockroachDB. 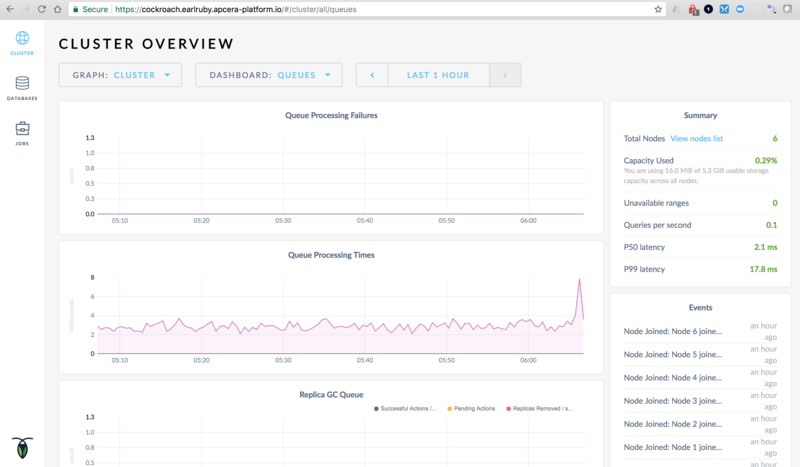 In many cases you can just repoint your application at a CockroachDB server and your application will run the same as it did using PostgreSQL. 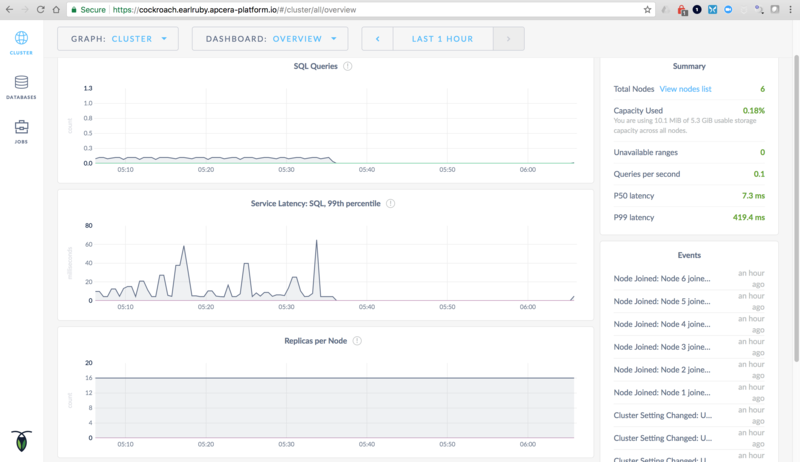 The first day I tried using CockroachDB I got a six-node system up and running using CockroachDB’s Docker image on my Apcera cluster using AWS EFS as a backing store in less than an hour. This is what I did to get it working. 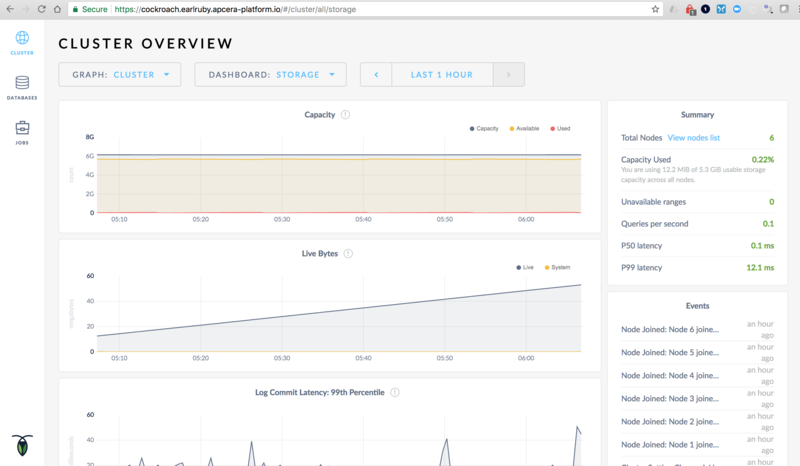 Set up the EFS volume using the AWS console. Create an NFS provider that targets the EFS volume. Create a namespace and a private network named “roachnet”. “roachnet” is a private VxLAN created by the Apcera platform that only containers that I’ve joined to the network can see. Next I create a container instance called “roach1” from the latest Docker image, open ports 8080 and 26257, tell it to use the EFS provider for storage, and to advertise itself to other CockroachDB nodes so they can find it and join the DB cluster. 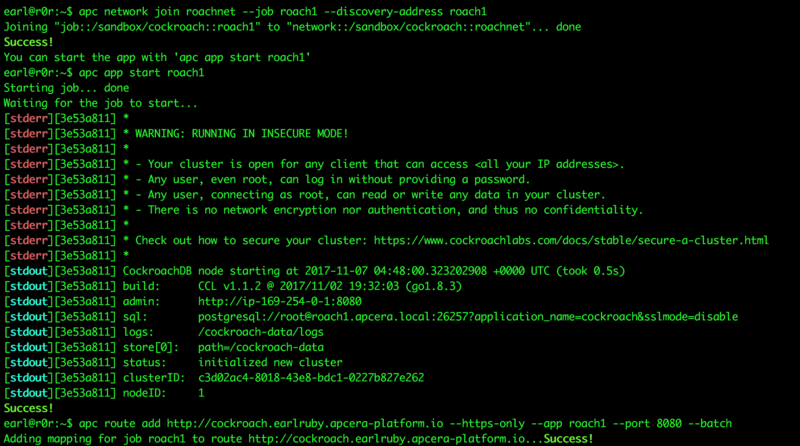 apc docker run roach1 --image cockroachdb/cockroach:v1.1.2 --port 8080 --port 26257 --provider /apcera/providers::apcfs-ha --start-cmd "/cockroach/cockroach.sh start --insecure --advertise-host roach1.apcera.local"
apc docker run roach$x --image cockroachdb/cockroach:v1.1.2 --port 8080 --port 26257 --provider  /apcera/providers::apcfs-ha --start-cmd "/cockroach/cockroach.sh start --insecure --join roach1.apcera.local:26257"
I added the “sleep 3” command because when I originally tested this (on CockroachDB 1.1.0) the platform started the containers so fast that the DB got confused and didn’t add all of them to the cluster. All nodes started, but only some joined the cluster. After I added the delay all nodes joined the cluster. After that the cluster was up and running. I could connect to the database, create schemas, create tables, add, update, and delete records. I’m pretty happy with the initial results. Next step is automatically generating secure certificates so I’m not operating in insecure mode, then I’m going to run actual applications against the cluster. This entry was posted in Containers, Storage. Bookmark the permalink.